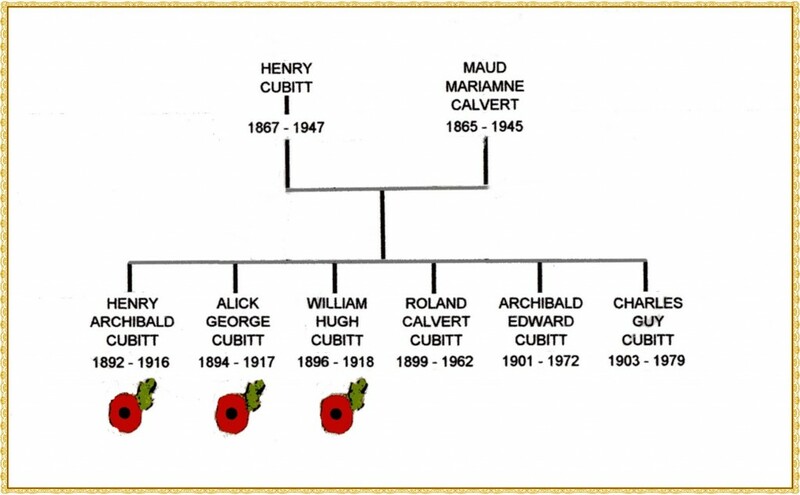 The three Cubitts on the Ranmore War Memorial (Henry Archibald, Alick George and William Hugh) were the oldest of the six sons of Henry, 2nd Lord Ashcombe, and Maud Marianne nee Calvert. Henry and Maud created the Cubitt Chapel in memory of their lost sons. Henry was the only surviving son of George Cubitt, 1st Lord Ashcombe, and his wife Laura nee Joyce. George Cubitt built St Barnabas Church. and developed the Denbies Estate inherited from his father, building around 30 cottages, the School, the Rectory and the Dispensary. He also purchased vast tracts of other land, mostly in Surrey, to extend the Estate. George and his wife were very philanthropic and did much for the welfare of their workers and tenants. George was the eldest surviving son of Thomas Cubitt, the famous London builder, and his wife Mary Anne nee Warner. Thomas Cubitt purchased the Denbies Estate and built a great mansion there. He had two brothers: another notable London builder Sir William Cubitt and the architect Lewis Cubitt. Their sister Mary Agnes Cubitt (later Cuthell) had a son Andrew who was Thomas Cubitt’s right hand man. 4. Roland Calvert Cubitt, 3rd Lord Ashcombe, born 26th January 1899, died 28th October 1962, married 1. Sonia Keppel, daughter of The Hon. George and Alice Keppel; 2. Idina Joan Mills nee Myddleton; 3. Jean Baylis nee Garland. Children of first marriage: Henry Edward (“Harry”), 4th Lord Ashcombe; Jeremy ; Rosalind (married Major Bruce Shand, children Mark; Camilla (later Parker Bowles, then Duchess of Cornwell); Annabel (later Elliott). 5. The Hon. Archibald Edward Cubitt, born 16th January 1901, died 13 February 1972, married 1. Lady Irene Helen Pratt; 2. Sibell Margaret Norman. Son of first marriage: Alick, grandchildren Amanda (later Sweeting); Belinda (later Naylor); children of second marriage: Mary Sibell; Priscilla Margaret (later Countess of Harrington); (Mark) Robin. Mark Robin had three sons: David; Hugo; and Mark Edward (later 5th Lord Ashcombe).